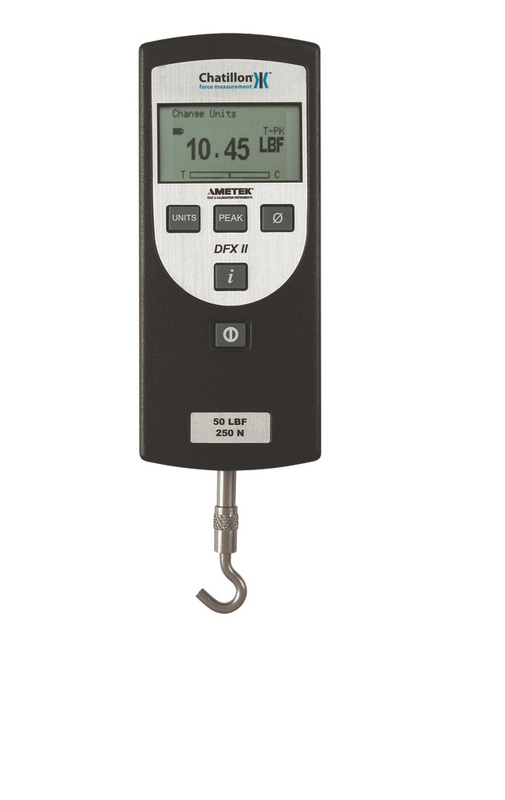 The Chatillon DFX II is available in four capacities (10 lbf, 50 lbf, 100 lbf, 200 lbf) and features an integral load cell with a measurement accuracy of better than 0.3% FS. A large, easy-to-read, high resolution dot matrix LCD display supports a variety of standard gauge functions including normal and peak readings. Loads are displayed in ozf, gf, lbf, kgf and N units. Automatic Shut Down: 30 minutes. May be disabled. Battery Life: Approximately 70 to 100 hours, continuous use.